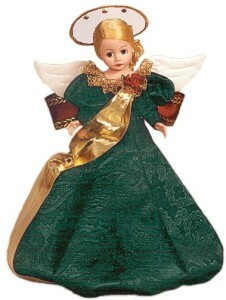 10" Angel of Grace Tree Topper is a vision in emerald green brocade accented with gold edging and burgundy rosettes. A gold and burgundy bow at the back of her waist flows to her hem. A gold lame sash is held by a burgundy rhinestone. Her halo adorned with rhinestones rests on her blonde hair.